Yesterday the family took a trip to the zoo. We wanted to go last Friday but got rained out. The weather today was spectacular. After lunch we visited the new stingray exhibit. 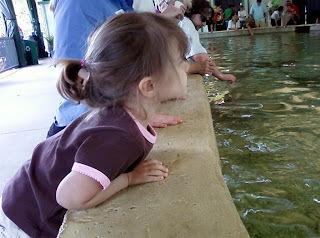 Alyce never touched the stingrays but I think she enjoyed looking at them and watching me feed them. The exhibit was cool I'm glad that we were zoo friends so we could get in for a discount. After the stingrays we took Alyce over to the sea lion tank for their afternoon feeding. 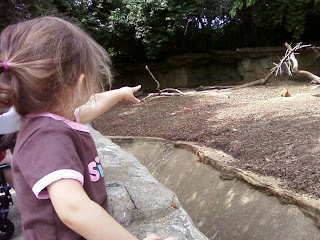 While waiting for the zookeeper to arrive Alyce was busy watching a peacock that had free run of the place. We also took at look at the black tailed prairie dogs. They are great animals for kids. They move around quite a bit, play, and eat lots of stuff. 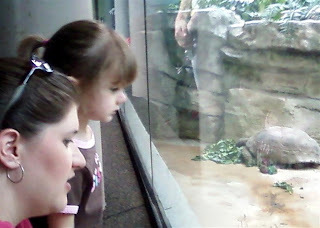 Following the sea lions we took Alyce to the reptile house. I was really surprised at how much she liked the snakes and lizards. There were lots of turtles too. I'm guessing that she is too young to find snakes icky. 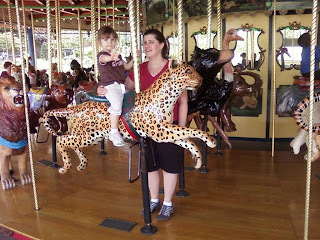 After the reptiles we stopped off for some ice cream and Mom took Alyce for a ride on the carousel. 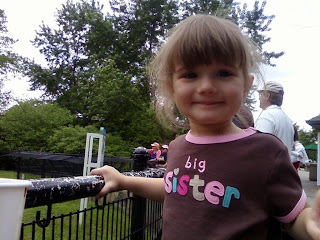 We had lots of fun at the zoo. Alyce behaved herself even though she didn't get her usual nap. She is getting to the point where she can miss the occasional nap and still keep it together. 0 comments on "Trip to the Zoo"